Whenever Peter and I listed the destinations for our world tour, as soon as we said “Turkey,” the listener would grimace and shake their head. “I wouldn’t go to Turkey,” they’d say. “Rethink that one. It’s way too dangerous right now.” We heard this so much and read scary events in the news enough to change our plans. Even though we didn’t plan to go anymore, we decided to check with a friend who covers Turkey as a free-lance journalist and documentarian. He flies there several times a year, so he would know better than anyone. We messaged him our question: Was Turkey safe enough to visit? His answer alarmed me. “Let me think about it.” The fact that he even had to think about it made me much more nervous and certain we shouldn’t go. However, when we actually met with him face-to-face, he changed his tune. “I thought about it, and you guys should definitely go! As tourists just visiting for a week, you’ll be completely safe.” He explained that, as a journalist, he had more to worry about with the current government, but we wouldn’t have the same concerns. Regardless of the go ahead, the closer we got to leaving Europe and heading to Turkey, the more nervous I became. How horrible would it be if something happened? Were we pushing our luck and being foolish? Maybe what everyone said was true, and Turkey wasn’t safe for tourists. As we landed in the airport, my stomach twisted in knots. We got to our hostel at Cheers Lighthouse and everything changed. Two guys greeted us: Morat, an easy-going guy from Turkmenistan, and the owner Tony, a Turkish man with a thick British accent and swagger. Istanbul had poured rain the last two days, knocking the power out in half the city, including our hostel. Despite the inconvenience, Morat somehow managed to heat some milk and make us two steaming cups of coffee. Tony and Peter hit it off right away. You’d think they were long lost brothers the way they joked and laughed together. Within 10 minutes, we felt like we were one of the family. Tony and Morat had planned a New Year’s Eve party, and they extended us an invitation. Tony said he did not feel safe going out for New Years this year. He suggested we do the same, and we agreed. Over hummus and baklava, Peter and I made fast friends with two fellow hostelers: Cameron, a college student from Michigan studying in Northern Ireland, and Patrick, a Canadian who spends his summers on reforestation and the rest of the year volunteering around the world. We rang in the new year with a few sketchy firecrackers off the back deck, great people, and a bottle of champagne. Not until the following day did I hear about the shooting at the Reina nightclub. The next morning, Cameron, Patrick, Peter and I set out to pay our respects to the victims of the attack by leaving roses. Going to the scene less than 24 hours after the attack made me nervous, but I also saw the importance of it. New Year’s Day was the first sunny day in a while, and the number of people on the streets surprised us. The Turkish people may be frightened about what’s happening in their country, but they are resilient. When we arrived, we couldn’t get within a block of the club. News vans packed the streets. Reporters clustered together waiting for updates. Police with full body shields blocked off all access to the club. We never even saw it. We must have been some of the first regular people to arrive because we didn’t see any type of memorial. Not knowing where to put our roses, we stuck them in a fence nearby and headed back. The media outside Reina Nightclub. With the exception of the tragedy at the Reina nightclub, we had such a wonderful time in Istanbul. 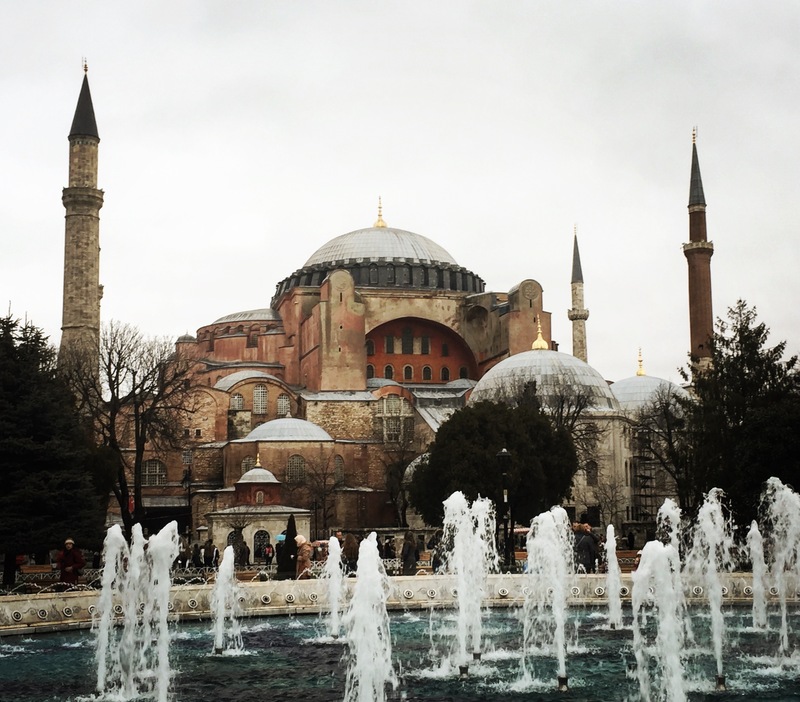 We visited the Blue Mosque, which gave me chills to see in real life. We also strolled through the hectic maze of the Grand Bazaar with 60 covered streets and thousands of shops. 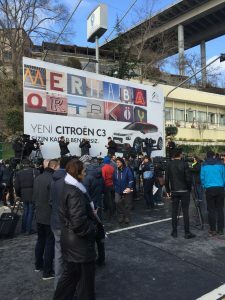 Finally, we hit our fourth continent by taking the ferry across the Bosporus to the Asian side of the city- an event that especially excited Peter. Prior to visiting Istanbul, I didn’t know half the city lay in Europe and the other half in Asia. Our adventures didn’t stop there, however. We had an especially harrowing time trying to get out of the city. We left Istanbul to catch a flight to Izmir. From there, we would catch a shuttle to Ephesus, an ancient city still under excavation. The shuttle bus we planned to take to the airport was full, so we had to cross town via the metro to catch another bus. We struggled finding the shuttle, but we spotted it just in time to see it pulling away. We waited a half an hour for the next bus. Luckily, due to light traffic, the usual hour and a half ride out to the SAW airport only took an hour. We walked in and began searching for our check-in desk. Our airline wasn’t listed anywhere. I jokingly commented, “I hope we’re not at the wrong airport.” Peter shook his head with certainty but checked the ticket anyway. We were at the wrong airport! We had four flights in and out of Istanbul- twice through the SAW airport and twice through Atatürk. We mixed them up. The airports sit on complete opposite ends of the city, technically different continents. It typically takes two hours to get from one to the other. Our flight departed in two hours. We ran outside and frantically explained our situation to the nearest taxi driver. He said he could get there in an hour on the private highway for $85 USD- an amount higher than the cost of our flight! I wanted to book a flight from SAW, but we didn’t know the cost, and we had a bus setup with our other airline. We made the split-second decision to take the taxi. I do not want to admit how scary this drive was or how bad it could have gone. Let’s just say we made a one hour drive in 37 minutes, without access to seat belts. Driving is hands down the most dangerous thing you’ll encounter in another country. The taxi dropped us off in the international section, but we had a domestic flight. We had 40 minutes until our flight left. You know those maniacs running through the airport with fear in their eyes? That was us. We ran the wrong way and ended up having to traverse the entire terminal again. My legs burned. Thank goodness we pack light! Panting, we rushed to our check in. No one stood in line and the attendants looked alarmed to see us. We rushed through security and made it just as passengers lined up to board. We laughed and shook our heads. I couldn’t believe we actually made it! What a way to start the morning! On the bus after our flight. We couldn’t believe we made it! Ephesus blew us away. Peter and I gaped in awe at the gigantic stadium and the two story library still standing from a city that met its peak in 300 AD. The Apostle Paul walked these same streets as he wrote The First Letter to the Corinthians.The 2,000 year old cobble-stoned streets gave us goosebumps. A few days later, we took a train to Pamukkale, a white mountain made up of calcium carbonate deposits created by a hot springs at the top. As the water runs down, it pools creating little terraces. We had to walk barefoot to preserve this “cotton castle,” but it fascinated us. The natural hot springs at the top had marble columns inside it from the ancient city nearby. On our last day near Pamukkale, a snow storm hit Istanbul. They received two feet of snow and the whole city basically shut down. The airline canceled our morning flight and we had to reschedule for the evening. As we walked out the door, our Australian friend Lorne showed up. He looked exasperated and shook his head. “They canceled my flight. I think they canceled all the flights tonight,” he sighed. We checked with the front desk, and they said every flight had been canceled. Peter hadn’t received a cancelation email, so we asked the hotel attendant to call the airport and check. He eventually got ahold of someone who agreed our flight was canceled. Still though, the airport website said the opposite. In the confusion, we missed the $2 shuttle to the airport. Now if we wanted to make our flight it would have to take a $45 USD taxi. We also ran the risk of paying $45 USD to get there, discover that they cancelled our flight, and have to pay another $45 USD to come straight back. We decided to take the risk. Once again, we shoveled out a wad of cash to make our flight in time. The flight ended up getting delayed two hours but the airline did NOT cancel it. Thank goodness! Our poor friend Lorne had to take a night bus on the icy roads in order to get back to Istanbul for his flight. We arrived at our hostel at 5am. We had to wake up five hours later to turn around and go back out to the airport. (At least we got the right one this time!) 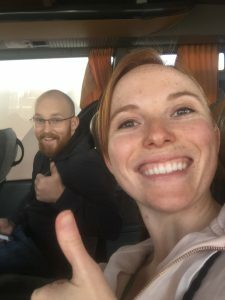 Long, long story short: we made our flight to Cairo! So. . . Was It Worth It? Absolutely! Despite this trip sounding like a nightmare, Turkey has been one of my favorite destinations. When we weren’t busy running around catching flights, we fell in love with this country. Turkey is an enchanting mix of the modern world and tradition. It’s primarily Muslim but very much secular at the same time. The only time I had to worry about my skinny jeans or western clothing was entering a mosque. It’s the people of a place that make or break your opinion of a country, and I can’t say enough good things about the Turkish people. They are some of the friendliest locals we have met so far, and they are so thankful for tourists. I understand our friends’ and families’ valid concerns for our safety in Istanbul. I felt concerned myself. However, the sad fact is that mass shootings occur everywhere. No less than two days after the shooting in Istanbul, a man attacked the Florida airport. Just like I won’t let that tragic event affect my decision to visit Florida, I won’t let similar tragedies influence whether or not I visit wonderful places like Turkey. I get the sense that Istanbul and other touristy areas are a ghost of what they used to be. Streets that formerly bustled now sit quiet. One local told us the Istanbul universities used to get up to 6,000 students from Europe alone, and now they get less than 600. If the terrorist are trying to scare people away from Turkey and bankrupt the tourism industry, they are succeeding. Don’t let them. Go see Turkey for yourself. I know I would be happy to return one day. Loved reading this article. Top job on the blog site–entertaining reads! 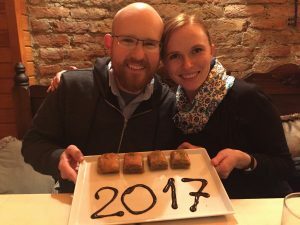 Safe travels you two–hopefully we cross paths again one day! Loved reading this, Emily! I’m so happy everything turned out well for you and Peter. And thanks for giving us another look at what’s going on in the world.